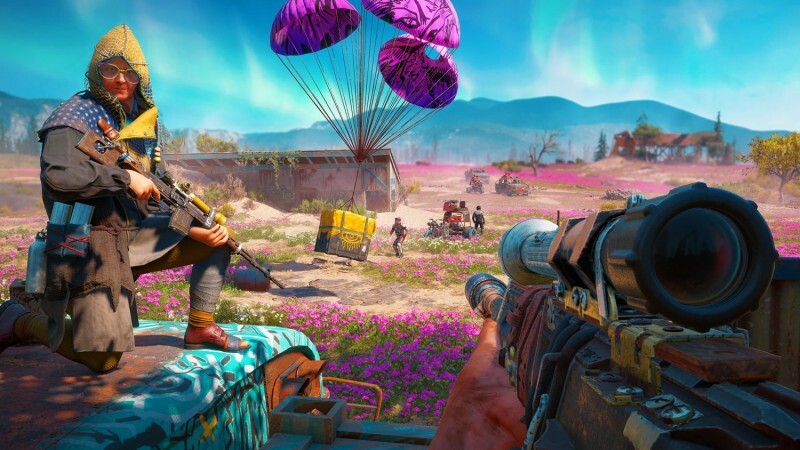 Far Cry fans are no strangers to visiting exotic locales, but New Dawn’s vibrant post-apocalyptic setting promised to introduce some drastic changes to the aging series. While the neon-hued flora and mutated fauna successfully shake up the landscape, the superficial progression changes and formulaic story do little to accentuate this new coat of paint. 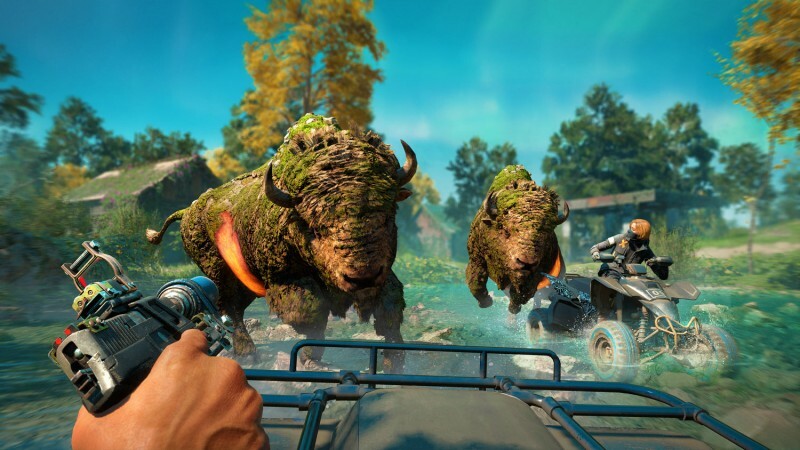 If you’re a longtime fan who is simply looking for more Far Cry, let me save you some time: New Dawn delivers all of the enemy-laden outposts, gory stealth kills, manic co-op, and compulsive item collecting that you’re used to, and the gunplay is still rock-solid. This entry is still fun, but if you’re looking for a game that moves the formula forward in interesting ways, New Dawn’s changes rack up more misses than hits. Set nearly two decades after the collapse of society that was prophesized by Far Cry 5 antagonist Joseph Seed, New Dawn focuses on a handful of survivors trying to rebuild a community in a makeshift base called Prosperity. Unfortunately, Prosperity’s success quickly garners the unwanted attention of twin sisters Mickey and Lou, who control Hope County with an army of appropriately post-apocalyptic misfits. Your job, as a good Samaritan with impeccable marksman skills, is a familiar one: wrestle control of the region back, one outpost and side activity at a time. Far Cry narratives have had their ups and downs over the years, but New Dawn’s story just feels creatively bankrupt. 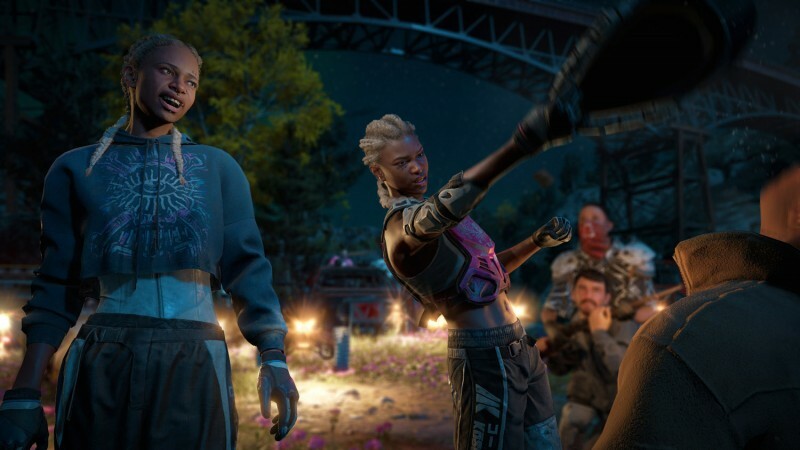 Unlike previous Far Cry antagonists, Mickey and Lou are irredeemably one-dimensional, their Very Bad personalities hinging on a solitary anecdote from their childhoods. Their delivery is equally formulaic – you can expect the usual philosophical monologuing (though mercifully less frequent than Far Cry 5), the random displays of “shocking” violence in cutscenes, and the post-mission radio taunts that are never really explained how or why you’re hearing them. New Dawn’s story missions also feel overly familiar, and at times downright perfunctory. The gunner seat sequence, the hallucination sequence, the arena fight sequence – they are all here, and provoke little more than a sense of déjà vu. Thankfully, the majority of your time is still spent exploring the world and taking down outposts, which remains a challenging and satisfying hook that propels along the experience, as do some memorable side missions. It is a testament to the series’ strong backbone that even without a lot of new bells and whistles, I still enjoyed the majority of my time with New Dawn. This was also true of one new addition to the familiar side activities, expeditions. These discrete side missions ferry you off to smaller locations to nab a bag of valuable resources. Functionally, expeditions begin like outpost takeovers but end with a mad dash to an extraction point with hordes of enemies on your tail. They are a solid addition to the Far Cry formula, and I appreciate the variety they offer. Both expeditions and outpost missions can now be reset at a higher difficulty level for more lucrative rewards. This introduces an intriguing push-your-luck element to replaying missions, but I wish the added challenge didn’t just boil down to enemies with bigger HP bars and more shields. New Dawn completely rejiggers the series’ progression systems, but the changes end up being a wash. A new leveling system offers a few color-coded tiers of weapons and enemies, but the higher-level foes only sport more brawn, not brains – your best bet is still to pick them off with silenced shots or stealthy close-quarter takedowns. The new crafting system and base upgrades are a new way of serving up the same old unlocks: upgrade the garage to spawn new vehicles, upgrade the infirmary to increase your health, etc. The crafting system works fine, but the actual weapons and items you’re crafting aren’t particularly exciting. This is doubly true for how New Dawn handles ability unlocks. Skill points are now doled out for specific challenges, like killing five enemies with a bow, distracting three guards with rocks, and hunting three deer. I enjoyed the open-ended nature that challenges provide, and they helped nudge me out of the usual gameplay rut by encouraging the use of different weapons. However, the actual abilities you can unlock are positively dismal, making you sink numerous points into mundane options like unlocking binoculars, increasing your breathing capacity, and the ability to repair vehicles. A few late-game perks offer some interesting twists, but are too little and come too late. All of the progression changes in New Dawn feel like they serve a dark master: microtransactions, which are front and center in the crafting menu. Need more components to upgrade a weapon? Buy a components pack! Can’t wait to unlock that fancy new car? Buy it with Far Cry coins instead! You can even buy extra skill points with money. The in-game economy is more dystopian than anything you find in New Dawn’s irradiated landscape, and even though you can see and do everything the game has to offer with time and patience, the continual reminders that you can skip the grind for a few more bucks just feels gross. The core formula of this series holds up, but New Dawn struggles to make worthwhile contributions to it. Beyond the expedition missions, little about New Dawn actually feels new, and the only interesting narrative threads are the tie-ins to Far Cry 5. When all the best parts of a new game are the old parts, it’s hard to be excited about what comes next.